Dang. I just went through the list. It seems like it is going to be a good decade, but so many books by authors I love (and many cozy reads), it was actually rather boring to annotate the list. Maybe you all have suggestions which of these gems I should read. As usual, the full TBR can be found at the bottom of the post. I’m probably going to go for the Sherriff. I was so excited to find this volume as his books are hard to find here in the US, but I’ve been sitting on it for a long time. I have so enjoyed (loved) The Fortnight in September and The Hopkin’s Manuscript, I think I was afraid to read another Sherriff in case it wasn’t good. And this one has a co-author. Those always make a bit wary. This one is a total question mark. I have no idea which of these rise to the top when the time comes. This could be a really good year. I mean I could read my way through this entire year and be pretty happy. This is the opposite of 1931, all of these jump out at me. This may be the earliest Thirkell I have, so that one may win the race. An obscure Sinclair Lewis. That’s probably going to be the winner. I’ve read most of his novels and I’ve owned this one for a long time. I feel like Stuck in a Book recently posted something about A Pin to See the Peep Show, and what about that title. Hmm. My guess is a book I wrote with that title would not be similar in anyway to the one Thirkell wrote. I really want to say Ambler on this one but I’ve had 3 or 4 Dawn Powells on my shelves for a very long time. I think it is probably time to get her a go. Even though I have other of her books (is that grammatical?) I like starting with an author’s earliest books as possible. Boy, the 30s really are a cozy-fest. If I was adventurous I would choose In Hazard. I bought it solely for its cover. Friends and Relations by Elizabeth Bowen is very good, I also thought Poor Caroline was excellent. I have three or four of those 1932 books so can’t help you much there but I might go for the Beverley Nichols. I love Antonia White and although Frost in May isn’t my favourite of the quartet I would recommend it. 1936 – A Summer will Show is wonderful. Not sure about your 1937/8 lists I think there might be better things out there. Brighton Rock though is definitely not cosy if you want a rest from cosy, it’s also short. I liked but didn’t love it. 1939 Manja no question, utterly brilliant and definitely not cosy. I really want to follow-up on your Manja recommendation but I just realized that The Confidential Agent which I am halfway through is from the same year. These are the kinds of problems I am going to have this year. I will have clashes like that too. Sometimes I might just read the other book too though. Lots of overlap with my own list for this decade! Like Ali, I have to recommend Manja for 1939 (though many people consider The Brandons their favourite Thirkell). It’s far from subtle but is still absolutely fascinating and one of the more important books Persephone has brought out. Intrigued to see Journey’s End for 1930. Is that the novelisation? I’m currently reading the play right now (from 1928). Could be interesting to compare! I’m still suffering from the fact that Thirkell wrote so many and I wan to read them in order. I really need to get over that little bit of OCD. Oh, These Men, These Men is very FAR from typical Thirkell, not set in Barsetshire and not a cosy read. You might or might not like it, but don’t judge her by it. Summer Half is perhaps my personal favorite of her Barsetshire series, the first time I believe that she KNEW she was writing a series. High Rising, very early in the series. The Brandons has been published in more different editions, including by book clubs. You have peaked my interest in Oh, These Men and based on others for that year there is a very good chance that it’s going to be the choice. I started the Thirkells in December, High Rising was delightful. I’ve read three in the series so far and enjoyed all of them. Great light reads (though there is a bit of racism which is off-putting). It’s hard to find stuff from that era that didn’t have a whiff of racism. Ooh, I did Jenny Wren for 1932. I’ve already got Pomfret Towers on my list, otherwise I’d use The Brandons for 1939, as I have that one. You want to see the other 30s I’ve done, don’t you? After I had finished my “complete” TBR list I found a small stack of mass market paperbacks which includes The Edwardians. So I guess I could throw that into the mix as well. It’s interesting to look at my largely white, Anglo, and fairly twee books for the 1930s and realize they exist in the same universe as Zora Neale Hurston. I think I could happily read just from your 1930s shelves for years and years. Wonderful! And, yes, A Pin to See the Peepshow made my list for favourite books of the year – Rachel and I also compared it to an EM Delafield novel about the same murder case on Tea or Books? some time ago. 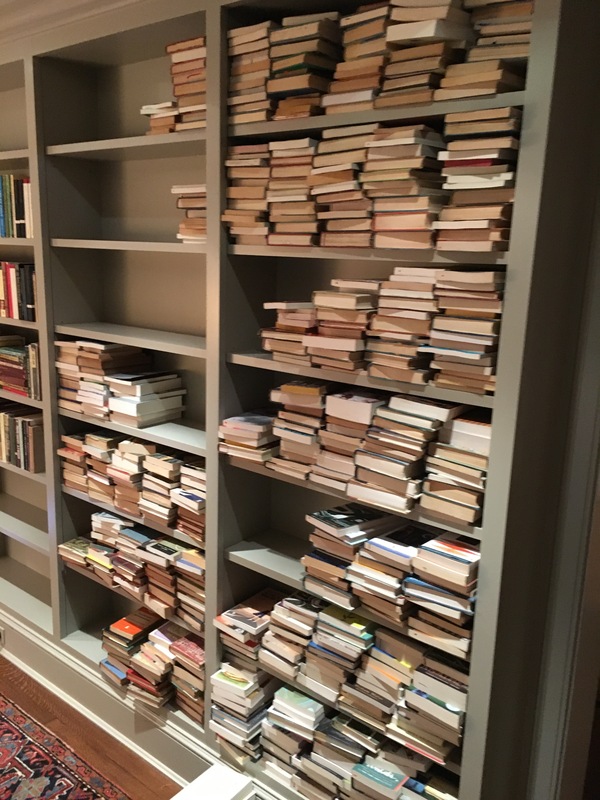 With only 79 titles for the decade, you COULD read only from my 1930s shelves in 2019. Sounds like you’ve just created next year’s challenge. I loved High Rising. Thirkell is perfect before bed reading – light humor, nothing serious. Some of Dornford Yates’ Berry books- Adele and Co (1931) and And Berry Came Too (1936)- I was planning a thirties theme for my reading as well (but only from my TBR) and have so far Thirkell, Priory (Dorothy Whipple), Edwardians (Vita S-W), and a couple of Crime Classics – Murder in White and Murder in Piccadilly on my list.